Not very sound thinking, was it? Of course it was... it's one of the best things we ever did! I spent the month of August that year getting the house ready to sell. And at the same time, I was shopping for a motorhome. 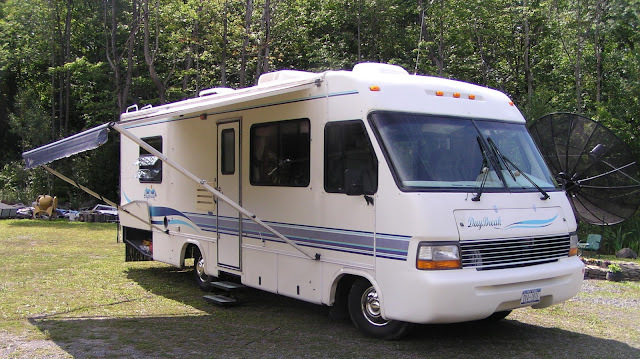 I quickly realized that even with the exchange rate difference it was much cheaper to buy a motorhome in the United States and pay the importation fees to get it officially into Canada. 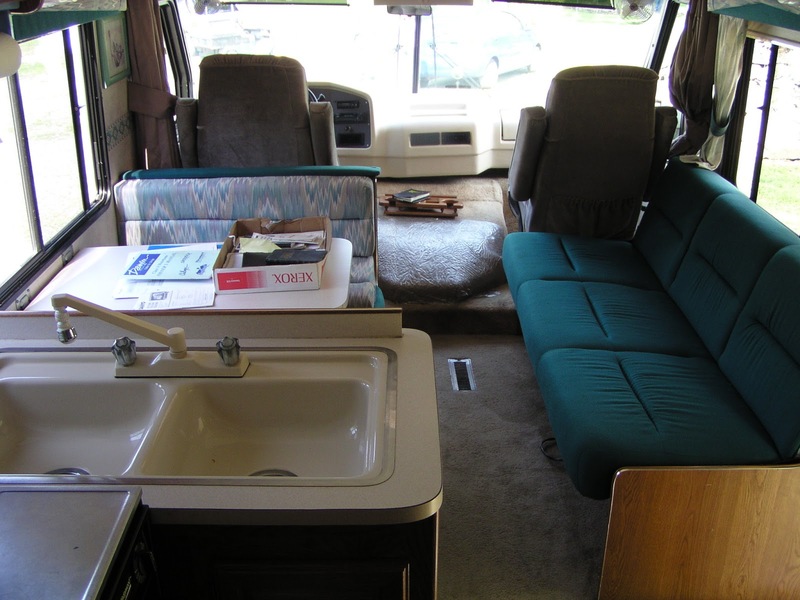 I spent two weeks scanning Craigslist and similar online ads looking for a suitable motorhome. Then I saw it... a 27' 1996 Damon Daybreak. I think the asking price was $12,900. (I still have a copy of the ad, but it's with all of our paperwork inside the motorhome back in Ottawa). It was located just outside of Albany, New York. I spoke to the guy on the phone and everything sounded great. It only had 25,000 miles (40,000 kms) on it, yet it was already 11 years old. Hardly been used! We made arrangements to go down and look at it that coming Sunday. The first picture we ever took of Sherman. There have been many more photos since that one! If he only knew what kind of adventures he would be going on! Up until then, he had spent the first ten years of his life going back and forth from New York to either Florida or Arizona and then spending all winter and then all summer parked in the same place. We had a good look at him, and made the deal. I can't remember, but I think it was for $12,500 USD which at the time was about $13,100 CAD. We left a deposit, and made arrangements to come back the following Sunday to pick him up! And there's the little blue car too! We didn't even take him for a drive. The guy who was selling him was an ex police officer and we just seemed to hit it off. Sometimes you just get a good feeling and everything works out. When we got him back to Ottawa, we had to pay about $2,000 CAD in various taxes to get him registered with Ontario plates. And then we spent about $1,000 CAD on service work that I wanted to get done prior to taking him on a long trip. All in all, by the time we hit the road we had spent $16,455 CAD. Need a new bathroom scale...? Sherman has an excellent layout. He doesn't need a slide out with that kitchen counter dividing the living area. Great purchase that brought you guys so much pleasure. He has definitely served us well but then we also pamper him too! He has turned out to be an amazing deal and hasn't hesitated take us on all these adventures, even when he gets taken on some of our mystery tours, poor guy! Well, a very happy Anniversary to y'all and Sherman. A very good match indeed. What a great deal; you came across way back when, Sherman sure has served you well and am sure he will continue to do so, Keep having fun on the road. Sherman has served us well and has more than paid for himself. With lots of tender love and care he should continue to serve us well into the future, with a whole lot more adventures. Sherman, keep going because I love reading about your adventures! Thanks Kay, we will make sure to give him lots of tender love and care so that he can keep taking us on all these fun adventures. Happy anniversary to Sherman! Looking forward to another decade and more of cool travel adventures with Kevin and Ruth! Happy Anniversary Sherman you have done your owners proud! Glad you and Ruth have had so many exciting adventures! Thanks Brigitte, and he sure has done us proud! I bet he never saw adventures like that in his future before we met us. "repairs and maintenance along the way," Wouldn't regret that because those things follow you wherever you go, whether in a house or RV. Also, repairs and maintenance grow exponentially with the size of a house or RV. Just can't count the number of times I've heard RVers with very large units and with all the bells and whistles complain that they are overwhelmed with all the maintenance as, for example, always repairing one of their slides. I really think you and Ruth are missing Sherman! 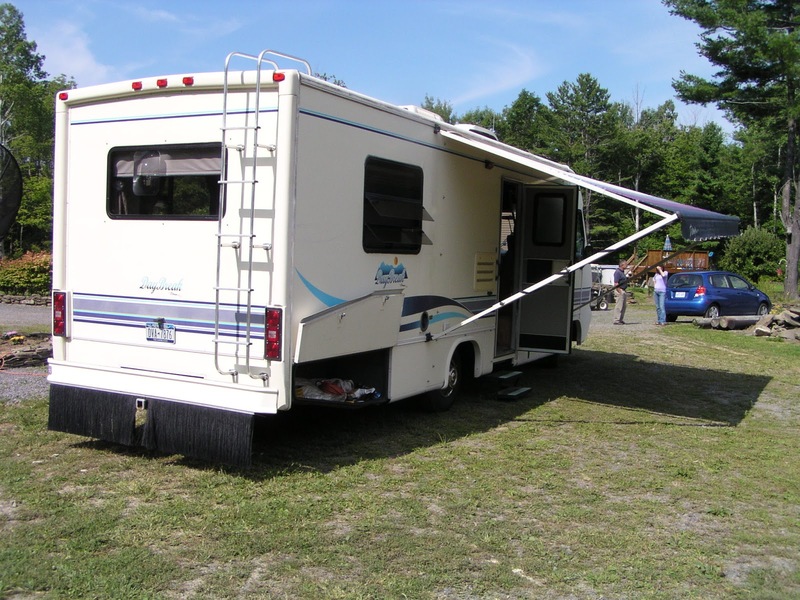 We purposely did NOT want an RV with slideouts or automatic levelers. And coincidentally, when I ran the parts department at that RV dealership for two summers, I did notice that the two most common problems in the service department were slideouts and automatic levelers! It was definitely a match made in heaven. Happy anniversary, Sherman! Wow, he sure has been to a lot of neat places and served you well. I wonder if you had to do it over again if you would have bought a smaller unit? Or the same size? That is hard to say because he is just about the right size for us, we would never go bigger but there have been times when smaller would have been better. If/when we head to Argentina we will definitely be going smaller though! We are currently in "George" -- 1987 Georgie Boy. He loves us and we love him. Built like a bunker, high quality furnishings, quiet as a tomb inside. Weighs 7 tons, has eight tires, and is 35' long. Every few months we spend a few hundred dollars (tires, tuneups, etc.) and he keeps chugging along. Awesome story :) Me and my wife just bought a Damon challenger that is a 92 model for $3000 and it only has 37,000 miles on it,We have decided to go full time, but have been wondering if we should upgrade or just see where the Old boy takes us. Sounds like you got a good deal on your Damon, I hope it is as good to you as Sherman has been to us. Very nice. The wife and I are retiring into our 1994 class C and will be heading to the lower level of the states for retirement during the snowbird season. If y'all get down here at some point, maybe we all meet up and do the potluck visit thing and all. Congratulations on the two of you retiring! I hope you will enjoy the full time RV living, I know that we sure have.